What do you get your geek husband who puts up with your obsessions all year? Who puts up with you nearly burning down the house while running the self-cleaning cycle on the stove on Wednesday? And then has to rewire all the smoke alarms because you ripped out all the alarms by the wires? Opps sorry babe. Last year, I got him bourbon drinking glasses which were a hit but sort of self-serving as I drink bourbon with him. 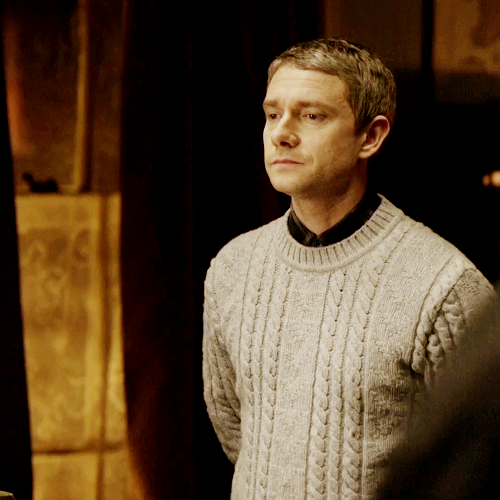 I had started knitting him a sweater last year based on BBC’s Sherlock but put it aside for other things. I pulled it out of my WIP(work in progress) pile and started again but needed more yarn. Knit Picks has it backordered until July. Nope. Not going to able to finish that in time. Birthday or Christmas, I guess. So I head off to Ravelry to search for patterns. Oh boy, can that be trouble! !! Hours later of searching patterns and project pages, I have a ton of ideas. Added another project for Birthday/Christmas. 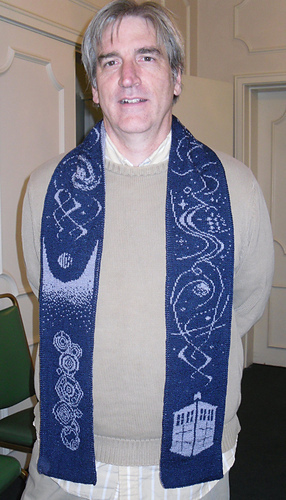 A Doctor Who scarf called The Name of the Doctor. Now, it is double knitted meaning that you knit with two contrasting yarns on each side to create a picture on main color and contrasting color side. Gorgeous. Never done double knitting, let alone with lace weight as suggested. Do some practicing but it will take months. Bought the pattern. 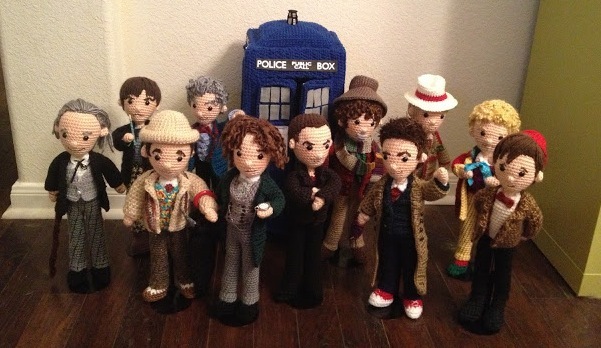 Found a designer that has created a whole line of Doctor Who amigurumi patterns including all the Doctors, Darleks, companions, and a TARDIS. Omg, too freaking cute!!!! Bought the David Tennant amigurumi. See a pattern? Pun intended. 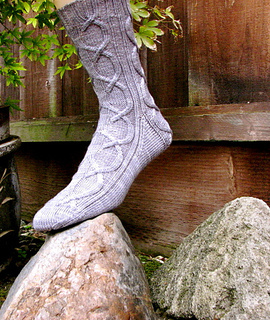 Next found a designer who created a sock pattern inspired by each one of the Fellowship in Lord of the Rings. Gandalf is real cool. So I went looking to find a pattern to make my husband a gift for Father’s Day and ended up buying three different patterns for a total cost of 22.00 before I even got the yarn and made something from the patterns. Perhaps, that is not the way to go. Maybe I could rework one of his DDO characters. He says that since I have been following DDOUnlimited and others on Twitter talk about Warlocks, I am responsible for TRing his 20th level drow wizard into a warlock come release day. But that might not be time for Father’s Day. Plus, I am good at building clerics. Unless the guild wants him to start running his cleric…..hey, wait a minute…..if he runs his cleric I get to run my fighter!! WIN!!!!!! Oh wait, self-serving again. Sigh….back to the drawing board.